Thanks for your comments Rick and the letter ( DOWNLOAD FILE ) that you wrote to us. We always like to help our customers with advice on tents and to hear how our tents are performing in the field. I just wanted to say that I purchased a similar tent to the 644 almost 8 years ago and absolutely love it. It has stood up to harsh weather, from desert heat to mountain snow and high winds, over months of camping time. It never leaked or otherwise failed me the whole time. Unfortunately the nylon side-wall loops did fail this past fall (while I was cleaning it out to pack it for the Winter). That's something that probably wouldn't have happened if I had used a rain fly- nothing stands up to sun forever. In the next month- I plan to buy a new 647 tent to replace it- and I expect I will get at least 8 years out of it (with a rain fly this time). 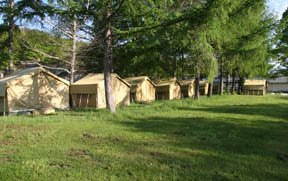 NOTHING beats a good canvas tent for durability and usable space, and these tents are very well-built and affordable. I'm new to tent camping. I just bought ModelXP3033-2 Two Person self erecting tent. The question I have is what do I do to tie the tent down to the ground after it is erected? What do I need to buy to make sure that the tent will withstand winds? There are 8 steel stakes and 4 guy ropes included in the package you received that you can use to stake the tent. There are also 4 guy rope attach loops at the 4 sides of the tent for this very purpose. I purchased a #647 in the summer of 2010 to use for a November Colorado Elk hunting trip. Everyone I know recommends the double wall canvas tents with no floor and a self made frame. I looked at many tents and decided on this style. I considered going with a competitors tent. After I talked to Kevin about the Pinnacle tent I decided to order one because I wanted a steel frame and a floor. The first person to see it up was a Colorado warden. He knew we were rookies, but when he saw our tent he was impressed! I couldn't be happier with this tent. It is everything that Kevin told me it was and more.